If you are looking for easy appetizer party recipes that involve just a bit more than opening a jar of salsa, this one is absolutely delicious. And it involves one of my personal favorite foods – cheese! Everyone seems to love cheese. Blend all of the ingredients into a soft mixture. Roll out the cheese mixture and cut it into strips. Place the strips on a baking sheet. If you want to be fancy, you can put the cheese mixture into a cookie press and press it out on to the baking sheet. Bake a few minutes at 300ºF until lightly browned. You can vary the cheese you use in this recipe but it must be a hard cheese (obviously not a cottage cheese or soft cheese like brie) and you should use a cheese with a fairly strong taste. Try sprinkling poppy seeds or sesame seeds on top of the sticks and press in just slightly. They will add an unexpected crunch and great taste. These cheese sticks are easy to make and are wonderful warm out of the oven or at room temperature. Serve them as one of your party appetizers, or with soup and salad for a light lunch. They are also great on a buffet table or as part of a bread basket at brunch. Try them with one of our quiche recipes. 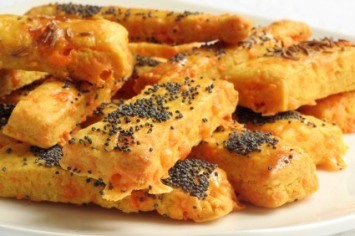 I recommend a fairly strong tasting cheese for this cheese stick recipe. The flavor of the final product will be much better than if you use a mild tasting cheese. You will find our entire collection of easy appetizer party recipes here.